Another week and another triumph for the ever wonderful chick pea flour. This time I’ve made a chickpea flour and roasted vegetable frittata. It is wonderful. Sometimes vegan replacement foods can be a disappointment. But this is not. 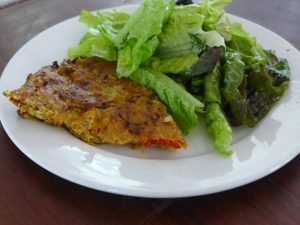 Chickpea flour batter is so fabulous as an egg replacement that I think many people, vegans and non vegans alike, could not tell the difference. The idea comes from the chickpea batter in a quiche recipe at The Gourmet Vegan. I ate mine with a salad made with some lettuce from my garden with avocado, and a dill flavoured, mustardy vinaigrette. Warning it is delicious, I’ve eaten a third of it already! 2-3 cups of roasted vegetables - I used a combination of cauliflower, pumpkin, red capsicum, and halved cherry tomatoes. Mix the chick pea flour with 1 cup of the water into a smooth paste. Combine the remaining ingredients in a saucepan and bring to the boil. Pour the chick pea flour mix into the saucepan and mix thoroughly. Lower the heat and stir continuously until the batter thickens. Continue to cook, stirring for another 3 minutes. Gently fold in the roasted vegetables. It will be quite thick. Scoop the mix into a oiled cake tin or flan dish. Smooth the top with a wet spatula. Allow to cool for 10 minutes before turning out of the tin.